Do you think I should add purple to my palette or should I just keep it with the 2 colors? I know this isn't a huge concern to anyone else I ask but it is to me. I would really appreciate any help you could give me. I love the simplicity of the white and pale pink but I love this purple color too and I just don't know what to do. To answer Emily's question, yes I think she should incorporate purple into her celebration! Not a whole lot of purple, but as an accent color. Here is what I envision for Emily's celebration. Bridesmaids: Since the bridesmaid dresses will be purple, there isn't too much of a need to incorporate the color elsewhere in the ceremony. Bridesmaid bouquets could be all pink. Stems could be wrapped in white, purple or pink. 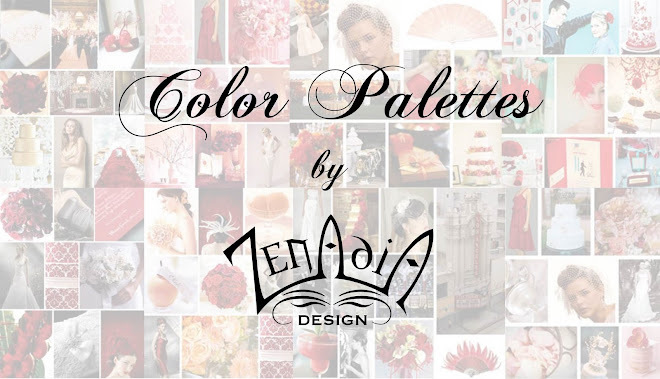 Emily (bride): Emily's dress is the one in the color palette, which I absolutely love. I think her bouquet could be all white, or white with a few hints of pink. She could accessorize with purple shoes to bring the purple color to her outfit. Groom and groomsmen: Emily tells me the guys are all in tuxes and the groomsmen and dads are wearing a slate gray vest and tie. They could wear a pink or white boutonniere with a little purple in the boutonniere if they wish. Ceremony decor: I think the people pretty much have the color purple covered. For a little ceremony inspiration I simply LOVE this photo by Jose Villa. I love the idea of white table cloths, pink and white floral arrangements, and purple napkins. If Emily wanted to have a simpler table, she could use all white linen, pink and white floral and tie it all together with a purple bow. I also love the idea of using fruit. Emily could do the centerpieces in silver vases, and surround table below each centerpiece with grapes still on the stock. She could even intertwine grape vines with the grapes to add a little green. I couldn't find a picture of that exactly, however here is a little inspiration via Oh How Charming. I love these seating cards via Martha Stewart. 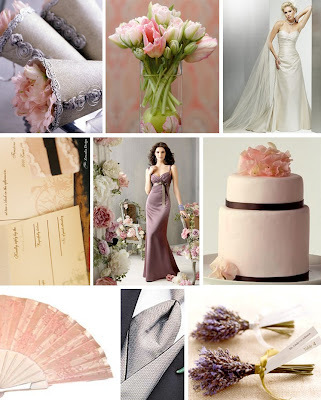 Lavender always lends an old fashioned feel, plus its a great way to incorporate the purple color. 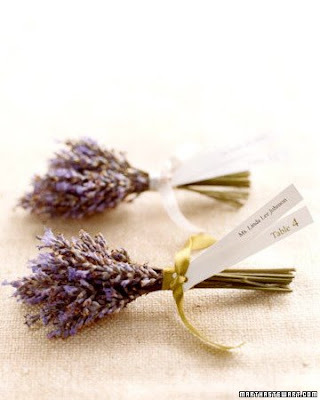 These can also be used as a favor, as guests can take them home and use them in a drawer to give it a fresh scent. 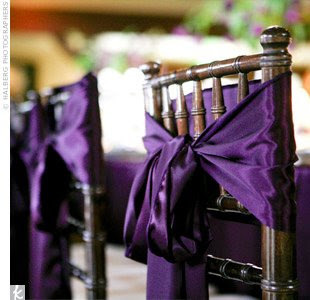 Another idea for some purple accents would be to tie the chairs with a purple bow. Via The Knot. 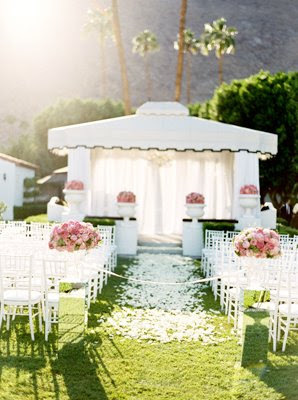 If its not in the budget to do every chair, consider just doing the bride and groom's chair. Finally, here is the board I designed for Emily. 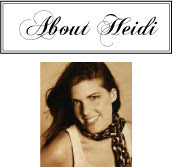 I hope this post can help her be able to plan the wedding of her dreams!